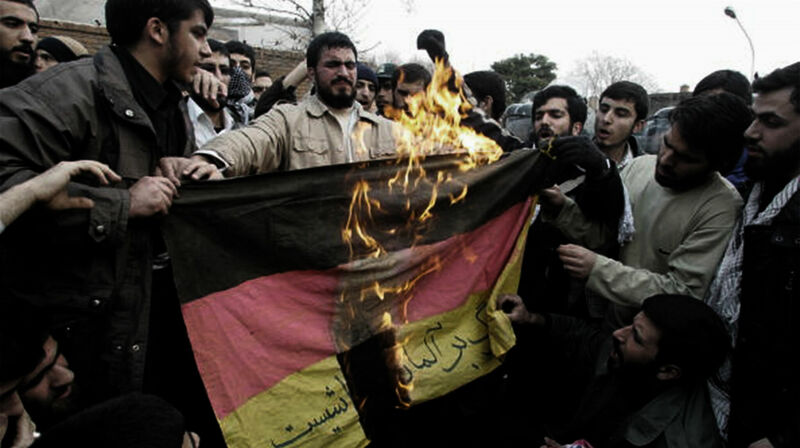 Iranian demonstrators burn the German flag during a protest outside the Italian embassy in Tehran Feb. 22, 2006. We have forecast for decades that Iran’s pushy foreign policy is about to meet its match. In recent years, the Islamic Republic of Iran has transformed from pariah to ally. Since the nuclear deal, spearheaded by the United States under the Obama administration, was implemented at the start of 2016, Iran has enjoyed the removal of economic sanctions and is conducting business openly with other nations, in some cases for the first time since the Islamic Revolution of 1979. This new international legitimacy, however, has not changed some fundamental realities about Iran. Iran is still a theocracy, governed by a radical cleric who, like 85 percent of Iranians, believes in Twelver Shiism, an ideology that embraces death. Iran remains the world’s number one state sponsor of terrorism, and it continues its march toward becoming a nuclear power. The Trumpet and the Plain Truth before it have been watching for decades for the emergence of two new power blocs that will collide with each other. One will be in the north, the other in the south. 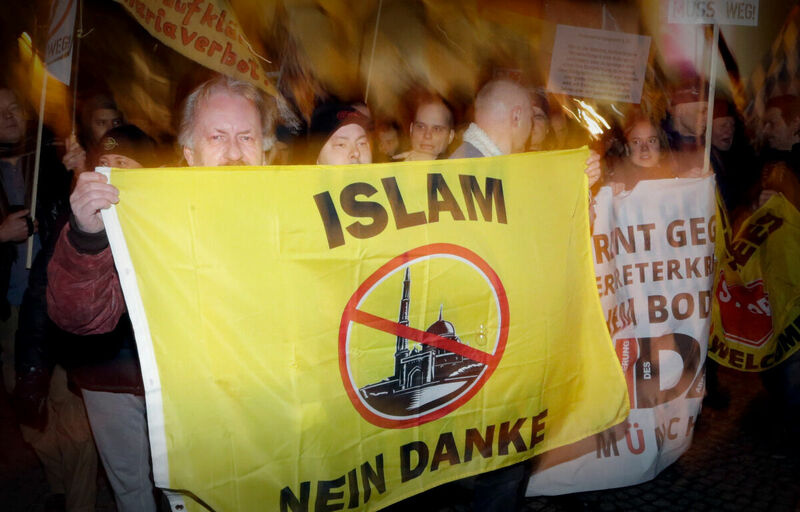 Supporters of the right-wing populist group PEGIDA march through Munich in opposition Germany’s open-door refugee policy. Germany took in approximately 1.1 million migrants and refugees in 2015. For decades, Mr. Armstrong warned that Europe’s intervention in the Middle East would be the arena in which it first reveals its true nature—consistent with its history—as a brutal imperialist power. From even before the end of World War ii to his death in 1986, Mr. Armstrong consistently prophesied that Germany would reunite, rebuild and re-form an empire that would dominate Europe. The European unification project has been long, onerous and difficult; it has been plagued by contention and inefficiency. Nevertheless, it has progressed as Mr. Armstrong said it would. The combined economic and military strength of European nations give this emerging empire enormous potential power. With the number and severity of threats rising in the world and within Europe, it is going to find a way to overcome its differences and unite, at least for a short time. Mr. Armstrong also forecast that this northern power bloc would launch an attack only after being provoked by the southern bloc. The northern power, he said, would be an upcoming German-led European empire. But who was this southern power? It doesn’t have to be Saddam Hussein—though it very well could be. Even if it isn’t Saddam Hussein, the king of the south shall rise in that part of the world—and soon! Oil and money gives the king of the south power to “push.“ The king of the north (the European economic community) has shocked the world by its meteoric rise to power! Are we now seeing the king of the south rise in similar fashion? Then, in 1993, he wrote: “These verses point to a king of the south that is yet future. And I believe all indications point to radical Islam, headed by Iran as this king.” At the time, Iran was hardly considered a serious threat outside its immediate neighborhood. Yet this is the nation Mr. Flurry said would certainly become a regional power dominating the Middle East, a power bloc in the south that would inevitably clash with the German-led European power bloc in the north. And he repeated that forecast dozens of times per year from 1993 through to today. Why did Mr. Flurry forecast that Iranian-led radical Islam would dominate the Middle East? What were his sources? Why was he so consistent and so confident in that forecast? And why is it important? Mr. Flurry derived this forecast from the Holy Bible. This is the key Bible verse that describes the existence of a northern bloc and a southern bloc and a massive clash between the two. Daniel wrote this forecast in the sixth century b.c.—but he said it would occur a long time into the future: “the time of the end.” Just when is the end? There are many tangible proofs that it is the time we are living in today, and immediately before us! Is it really possible that this 2½-millennia-old prophecy accurately describes 21st-century Iran? Compare these scriptures to what has actually happened over the past couple of decades. The stage is being set for an Islamic group of nations to be led by Iran as the prophesied king of the south which will push at the king of the north, the European Union. Iran has a foreign policy with a lot of “push.” … Iran’s main strategic aim is to be the dominant power in the Middle East. Becoming the undisputed leader of the radical Islamic camp is a step in that direction. Looking around the Middle East, Iran clearly has a foreign policy with the most pushiness. Iran has a long history of being recognized by successive United States governments, as well as European nations, as being the world’s foremost state sponsor of terrorism. Iran actively seeks to destabilize nations where there is a significant Shiite population. In fact, every nation that has a substantial Shiite presence is currently embroiled in conflict. Hezbollah militants stand at attention in Beirut. The Shiite Muslim adherents, directed from Tehran, form one of the largest and best-equipped terrorist organizations in the world. In Lebanon, Iran has a direct hold on the largest and best-equipped terrorist organization in the world: Hezbollah. Hezbollah readily admits both its patronage and decision-making comes from Tehran. It has grown so large and powerful that it dominates even the Lebanese government. As of 2017, the organization has more than 150,000 rockets and missiles at its disposal to be used in the next war against Israel. In Syria, the government of strongman Bashar Assad is directly supported by Iranian troops of the Islamic Revolutionary Guard Corps Quds Force and other Iran-backed proxies. Iran spent $100 billion between 2012 and 2017 to keep Assad in power. If not for Iran’s powerful support, Assad likely would have fallen from power years ago, before an estimated half million people were killed. In Iraq, Iran is using the power vacuum created by the withdrawal of United States forces, as well as the fight against the Islamic State, to increase its own presence. In late 2016, Iran cemented its control over Iraq, when the Baghdad parliament voted in favor of accepting the Popular Mobilization Units (pmu) into its national security force. The 100,000 soldiers of the pmu pay only lip service to the Baghdad government; most of their decision-making comes from Iran. Iran has a long history of being recognized by successive United States governments, as well as European nations, as being the world’s foremost state sponsor of terrorism. Added to these nations, Iran is actively seeking to destabilize Bahrain and eastern Saudi Arabia, where again, large Shiite populations exist. It also seeks to bridge the Sunni-Shiite divide by funding the Palestinian group Hamas, which is committed to the destruction of Israel. Syndicated columnist Charles Krauthammer summarized these gains in an interview with Fox News: “Now, it’s true that the Houthis are against al Qaeda, but the real issue is that the Houthis are a client of, supported by, and in some ways advised by Iran. And as you saw on the map, the Saudis are looking at the Iranians in the north, the Iranian allies—which is essentially Iraq, Syria and Lebanon on one side and Yemen now—to the south and west under Iranian dominance, and they are scared to death. That’s why this is a double attack on us. It’s the loss of an ally against al Qaeda, and it’s a huge geopolitical gain for Iran, extending its influence over Arab states.” Clearly, it is Iran’s pushy actions that are destabilizing the Middle East. 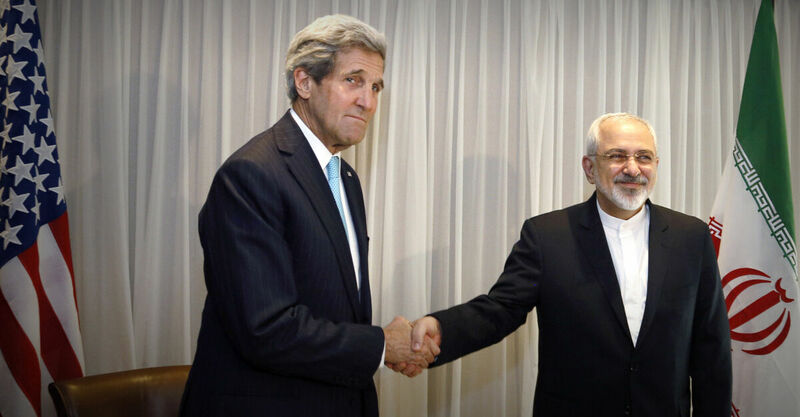 Iranian Foreign Minister Mohammed Javad Zarif met with U.S. Secretary of State John Kerry in Geneva. Zarif said this meeting was vital for progress in talks on Tehran’s contested nuclear drive. Furthermore, Iran’s pushy foreign policy is witnessed in its active pursuit of nuclear weapons. In the lead-up to the nuclear deal implemented on Jan. 16, 2016 (which Gerald Flurry has called the “worst foreign-policy blunder in American history”), Iran was outspoken in its desire to acquire nuclear weapons. The so-called moderate President Hassan Rouhani boasted in 2002 that while Iranian leaders assured the Europeans they weren’t developing a nuclear program, Iran was able to install at its Isfahan plant equipment for conversion of yellowcake—a key stage in the nuclear fuel process. “From the outset, the Americans kept telling the Europeans, ‘The Iranians are lying and deceiving you and they have not told you everything.’ The Europeans used to respond, ‘We trust them,’” Rouhani said. Alongside a host of other evidence, this type of subversion shows that Iran still seeks to gain nuclear weapons. While both terrorism and nuclear weapons form part of that pushy foreign policy, the Trumpet also watches two more specific pushy acts from Iran to set off the clash of civilizations. The Trumpet has noted that Iran’s push will likely come in part from its having gained control of the Red Sea passageway and thus the ability to stem the flow of oil and other precious commodities into Europe. This strategy first came to light in 2011, just before the “Arab Spring” wave of radical Islam spread across North Africa, toppling governments in Libya, Egypt and Yemen. At the time, in his article “Libya and Ethiopia Reveal Iran’s Military Strategy,” Gerald Flurry showed how Iran’s interest in forming an alliance with or even controlling Libya and Ethiopia (as well as Egypt and Tunisia) would stem from its desire to have power over the crucial trade route linking the Mediterranean with the Red Sea. Controlling the Suez Canal is not enough. Egypt tried that in 1956, when Britain, France and Israel kicked it out in one attack. But what if you have radical Islamic nations along this sea trade route with real air power—including missiles? That could give Iran virtual control of the trade through those seas. Radical Islam could stop the flow of essential oil to the U.S. and Europe! Iran already dominates the Persian Gulf. Now it is working to take over the Red Sea. You can see this by how involved it is in Yemen, the heavy influence it has gained in Somalia, and the long-standing relationship it has had with Sudan. 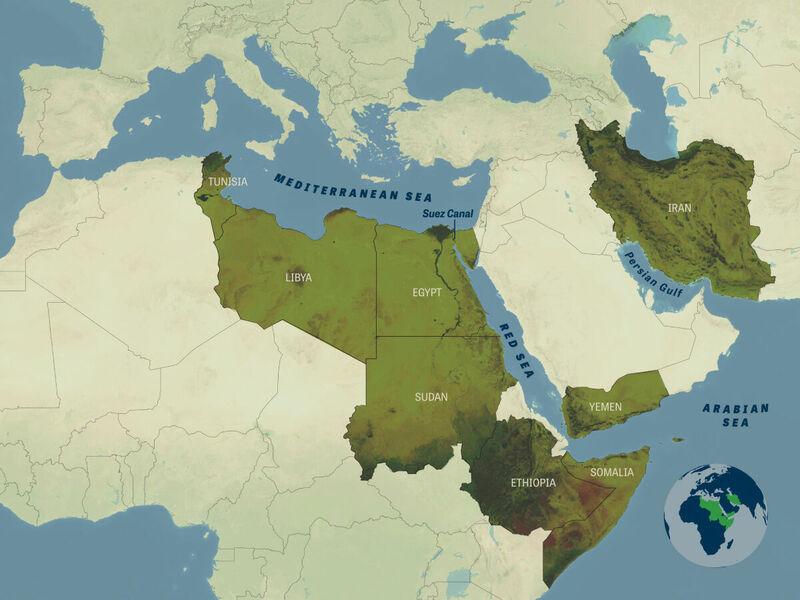 This biblical prophecy reveals that it will gain control of Ethiopia and of Egypt, which controls the Suez Canal, the gateway to the Mediterranean Sea. “He shall stretch forth his hand also upon the countries: and the land of Egypt shall not escape” (verse 42). As we have said for 20 years, this indicates that Egypt will join in an alliance with Iran. But notice who else will be in that alliance. “But he [the king of the north] shall have power over the treasures of gold and of silver, and over all the precious things of Egypt: and the Libyans and the Ethiopians shall be at his steps.” “At his steps” means they will join his army or be under his authority. Why would Libya and Ethiopia be subjugated like this by the king of the north? They too were allied with the king of the south. Iran already dominates the Persian Gulf. Now it is working to take over the Red Sea—a crucial passageway for the flow of oil and other precious commodities into Europe. Connect the dots on the map, and you can see that Iran seeks to control the greatest trade route in the world, which will give it leverage to push powerfully against Europe. However, history and prophecy indicate that there is another, more potent reason for the clash between these kings: They both want Jerusalem. Though the Jewish nation of Israel currently controls it, both Muslims and Catholics have designs for the Holy City. Iran’s desire for Jerusalem is blatantly obvious. In 1997, Iran conducted major war games code-named “Road to Jerusalem” in which at least 150,000 soldiers participated—some reports said it was as many as half a million. Numerous Iranian missiles, especially its latest designs, are inscribed with “death to Israel.” Iran has funded Hamas, the Gaza-based terrorist organization that is sworn to Israel’s destruction and has started at least three wars in search of that aim. Iranian protesters burn an Israeli flag during a demonstration to mark the Quds (Jerusalem) International day in Tehran. Iran also controls Hezbollah in southern Lebanon. As of 2017, Hezbollah has 150,000 missiles in its stockpile ready to fire southward. Iran also hosts the International Conference in Support of the Palestinian Intifada. In 2017, it held the sixth such conference, which explicitly promotes the intifada, aimed at ending Israel’s very existence. The three most powerful men in Iran, the ayatollah, the speaker of the house and the president, all gave speeches calling for Israel’s destruction. By supporting these terrorist organizations, Iran is looking to get a foothold in Jerusalem. I believe Jerusalem is more important to Iran than the oil is. The Islamic people have fought the Catholic Crusades for about 1,500 years over control of Jerusalem. Bible prophecy says one final crusade is about to erupt. The soon-coming Holy Roman Empire—a superpower with 10 kings, dominated by Catholicism and led by the most deceptive and aggressive Germany ever—realizes that Arab fervor could spread like wildfire. Many Catholics consider Jerusalem their most important religious site. This forecast is informed by several prophecies, including the statement in Daniel 11:42 that this empire will “enter also into the glorious land”—referring to the area around Jerusalem. In Daniel 12:11 the prophet referred to this same power as “the abomination that maketh desolate,” which Jesus Christ Himself said was talking about the armies of this European power surrounding the Holy City (Mark 13:14; Luke 21:20). The king of the north simply will not stand for an Islamic takeover of Jerusalem. Daniel 11:40 reveals that as the Iranians push their own agenda—growing more and more confident by other nations’ weakness and inaction—they will be blindsided by a whirlwind attack that will wipe them out! Based on this prophecy, the Trumpet has forecast for 25 years that Iran and its radical Islamist allies are going to be conquered. The Bible even tells you how this will happen! Daniel 11:40 speaks of a “whirlwind.” This one word exposes how this clash with Iran will unfold. It reveals in detail what is about to happen in the Middle East—and in Africa, southwest Asia and Europe. This prophecy describes Germany and a resurrected, 21st-century iteration of the Holy Roman Empire. The Germans are excellent war strategists and warriors. They are savvy enough to realize that they will never have peace with Iran. They know that sooner or later, their two religions—their two civilizations—will clash. How could Germany do this so easily, so effectively and so quickly? Such a devastating offensive could not be summoned overnight. Think about the keyword in Daniel 11:40. The verse talks about an attack from the king of the north, but the emphasis is on the strategy of this military attack. If you’re in a whirlwind, it whirls all around you. It whirls you away! Look at the map and you can see the German strategy: to surround Iran and its allies. Germany’s strategy to deal with Iran aligns perfectly with Daniel’s prophecy: “… and the king of the north shall come against him like a whirlwind” (Daniel 11:40). A careful study of Germany’s military activity shows that it is already positioning itself to carry out just such an attack in the future. Gerald Flurry has written a booklet explaining this that you can read online: Germany’s Secret Strategy to Destroy Iran. The Iranians are so focused on conquering their own objectives that they don’t see what the Germans are doing. They don’t recognize how Germany is planning for the bigger war to come! Germany has expected to clash with Iran, and it has been working on a strategy for a decade or more. That strategy is almost complete. Germany has surrounded Iran. Daniel 11:40 is already in the early stages of being fulfilled! Iran and its Islamist allies are caught inside a whirlwind! The gigantic clash the Trumpet is expecting, in fulfillment of these biblical prophecies, all begins with pushy Iran. This is the same nation that is about to get the nuclear bomb. Iranian leaders and many of their people believe the 12th imam—their version of the Messiah—is about to return. They think his return can be hastened by creating violence and chaos. Several nations have nuclear weapons—but only Iran has leaders who harbor such dangerous religious thinking! What will happen when they achieve nuclear capability? What sort of chaos would they stir up if they thought it would cause their messiah to return? In the thrall of religious zealotry, they would not even care about their own destruction! But who is going to stand up to Iran? If no one will stand up to it today, when it does not yet have nuclear bombs, who will stand up to it when it actually has the bomb? The Bible does reveal that finally, after being pushed too far, the German-led European power will stand up to the king of the south. However, the clash between the king of the north and the king of the south all has a wonderful conclusion. Following the prophecy of Daniel 11 into chapter 12, which is a part of the same vision, we see that this clash will lead to catastrophic world war—“a time of trouble, such as never was since there was a nation even to that same time” (verse 1). Many other Bible prophecies talk about this period. Jesus Christ described it as “great tribulation” (Matthew 24:21). This is the dramatic climax of this age of man. Once it is over, God will begin to intervene in world affairs in a powerful way. Daniel 12:11 mentions an event toward the beginning of that “great tribulation,” when “the abomination that maketh desolate [is] set up.” Christ referred to this statement from Daniel in His famous Olivet prophecy (Matthew 24:15; Mark 13:14). He revealed that this “abomination” is actually “Jerusalem compassed with armies”—armies that are about to destroy the Holy City! (Luke 21:20). Putting all the prophecies together shows that these are the European armies of the king of the north after they have conquered the king of the south. Think about that! This prophecy reveals we are getting to a time where you can actually start counting days until the Second Coming of Jesus Christ! And it all begins with a push. The Trumpet has watched Iran for more than 25 years. It projected the rising aggression of its terror-powered foreign policy. Today, the world has begun to recognize that Iran is becoming what the Trumpet forecast in 1992: the “king of the south.” Yet analysts still do not realize what Iran’s future holds: Its aggressive foreign policy will explode into war—not with America, but with a new superpower! Why has Iran risen so powerfully? Why won’t America confront it? And who is this new superpower? The Trumpet has no special insight into the answers—except for its one “inside source.” That source is the Holy Bible. Find out how the Bible identifies Iran and what it forecasts for the future. 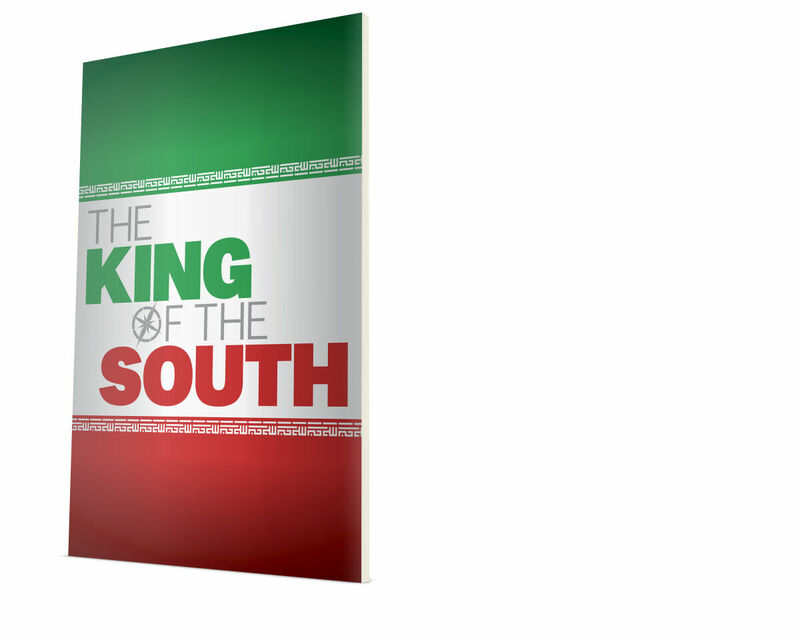 Request Gerald Flurry’s insightful free booklet The King of the South.